Employer's are frequently approached by staff to give annual holidays, sick or bereavement leave in advance and in excess of the staff member's current entitlement. There is no legal right from the Employer to comply to this, but very often Employers do due to the relationship and good faith etc entirely at their discretion. This situation is in essence a personal loan from the Employer to the Employee. In this situation we highly recommend the use of an 'Advanced Payment' policy. 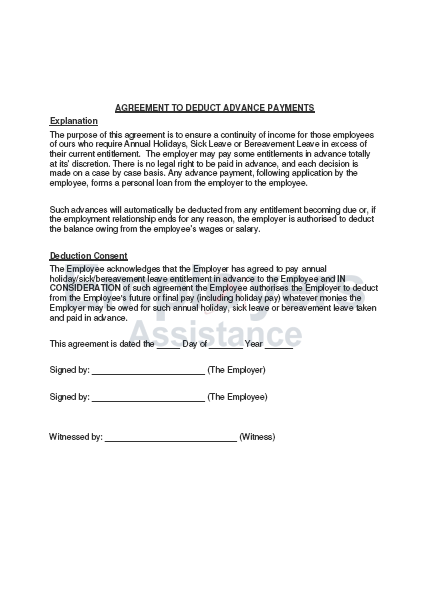 The Employer needs to get the Employee's written consent to deduct monies owed from wages. This policy document serves as a template for the Employer to do just that. By introducing this as company policy sets a common standard of understanding and protects the Employer from losing out. "..Having a team of legal experts on call has been perfect for us. Allowing me to keep focussed on my business knowing Employers Assistance have got me covered..."
"..EALs services and products have been invaluable in giving us the confidence and backup allowing us to focus on our business.."
"..It's reassuring EAL only represent Employers. This is great since there's no shortage of people who advocate for employees on a 'no win no fee arrangement'.."